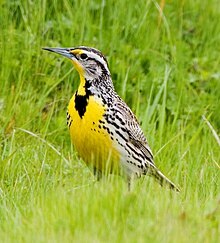 Western meadowlarks will occasionally interbreed with eastern meadowlarks where their ranges overlap; however, resulting young appear to have low fertility. During the 2017 regular session of the Oregon Legislature, there was a short-lived controversy over the western meadowlark's status as state bird versus the osprey. The sometimes-spirited debate included a legislator playing the meadowlark's song on his smartphone over the House microphone. A compromise was reached in SCR 18, which was passed on the last day of the session, designating the western meadowlark as the state songbird and the osprey as the state raptor.